The video above shows a talk Arvind gave at TED. In it he describes how he uses local trash to teach science to children in India. He also helps them to make toys themselves. Here are some excerpts from an article by Tithiya Sharma on the web site The Better India. It gives more background into Arvind’s work. When Arvind Gupta, an IIT Kanpur electric engineering alumnus, quit his job at Telco, his mother came to his defence stating ‘good, now he will do something noble with his life’. A prophetic statement from a woman who never had a day of formal education in her life but ensured that her four children excelled academically. 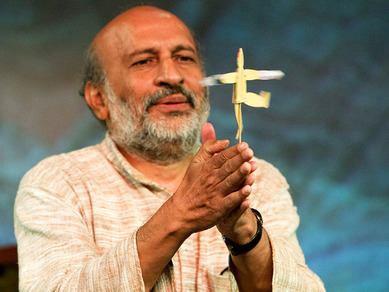 For almost 30 years now, Arvind Gupta has been taking his love for science and learning to the children of India. He’s the dream teacher we all yearned for. Gupta has travelled to over 3000 schools, demonstrating captivating science experiments to wide-eyed children. What sparks their imagination further is that Gupta uses only everyday garbage as the building blocks of these experiments. “All teaching aids we use are hand made. It‘s important for children to see that you don‘t need fancy materials. “Science can also hep you look critically at materials that are often considered trash, there is a lot of learning in that itself”. An empowering lesson for his pupils who are of limited means. They watch him in amazement as he explains everyday phenomenon like light and its laws of convergence and divergence with only used up ball-point pen refills, rubber slippers, empty tetra packs and anything else he can lay his talented hands on. Gupta believes that a love for science and the hunger to learn isn’t just the prerogative of the English speaking elite. On his website Gupta hosts thousands of books on science, that are free to download. Many of which he has painstakingly translated to Hindi himself. There are books in over a dozen regional languages too. The site also boasts over 700 science projects with videos, pictures and instructions. More than 6000 books are downloaded each day! Gupta’s dedication, perseverance and brilliance have not gone unnoticed. 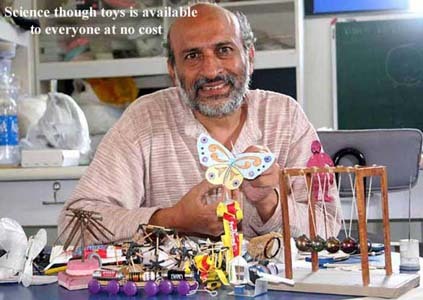 He has been recognized by organisations such as UNESCO, UNICEF, International Toy Research Association, Boston Science Centre, Walt Disney Imagineering and Research. He has received a special award given by the National Association for the Blind for designing teaching aids for pre-school blind children and the Ruchi Ram Sahni Award for science popularisation, among others. You can discover more at the site about the toys. There is also a YouTube site devoted to the work. Finally, here is another video of Arvind.